I have always LOVED history and government. Next to English, they are my favorite subjects. During my usual scan through the new non-fiction section at the library, I found a new series from Lerner Publication Company. It is part of their Searchlight Books collection. The series answers the important question: How Does Government Work? 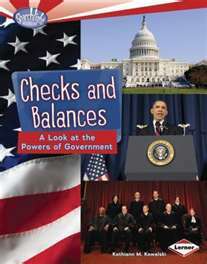 There are 6 books that coverall the main areas: Checks and Balances, The Congress, Documents of Freedom, Getting Elected, Judges & Courts, and The President, Vice President, & Cabinet. The information is broken down into small, easy to understand sections. Each book uses an abundance of photographs, from the past and present, which reveal people at work in various government capacities—from elected officials to staff to citizens. Let’s take a closer look at two of the books. The fascinating story of how our brilliant constitution was developed is described. It provides a context for why checks and balances were so important to the founding fathers. 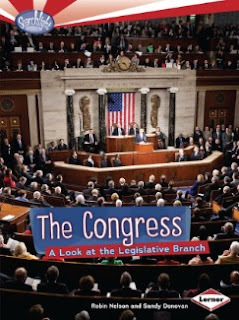 An overview of each branch of government fills out the middle three sections, making this book the ideal one to start with when reading on the topic. The book concludes with the relationship that citizens and the states have to each other and the federal government. Photographs show government officials, past and present, as well as everyday people working to make their country a better place. The book begins with a brief overview of the three branches. Then, the focus is on the basics of the House of Representatives and the Senate, such as size and functions. Next, the process of a bill becoming a law is described which begins with an idea and ends with a vote. Congressmen and women are shown going through the various stages, such as discussing it in a committee and presenting it to other representatives. Finally, the bill is presented to the President who must decide to sign or to veto it. This section illuminates what a president must consider as he makes his decision, the time frame he has for it, and the signing ceremony. Several photographs depict presidents signing bills into laws. The books, especially the ones on the 3 branches, do have some overlapping information. It is beneficial for youngsters to see how interconnected they are with one another. I, also, like that the narrative goes beyond simple fact. The authors work to make it personal and relevant. 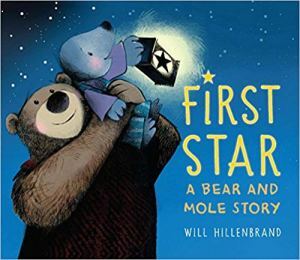 For more first-rate nonfiction titles, visit Check It Out, Nonfiction Monday host.